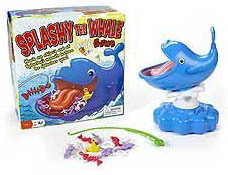 Splashy has many things in his mouth: anchors, fish bones, even a submarine. On your turn, use the fishing rod to try to remove something, but watch out. He willll spray you with water if you touch his tongue, or sometimes just when he feels like it. You will not get any points when that happens. At the end of the game, the player with the most points wins. For two or more players, ages five and up.